The tiles are made from nothing more than the usual MDF board topped with sculpted expanded-polystyrene, splashed with PVA and sand and finished off with emulsion paint sprinkled with flock. The only difference between bases and baseboard being that the paint on figure bases is allowed to dry before the flock is stuck on in clumps with PVA glue. 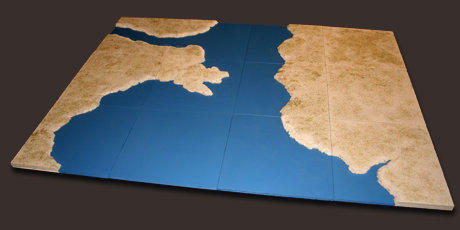 I designed my terrain tiles – the ‘tabletop’ I do all my battle gaming on – to suit all the periods and scales that I may ever game. They’re not the first design I came up with but unlike all the abandoned designs that came before, the present version has stood the test of time – and withstood the temptation of the endless upgrade. The original brief I set myself was to produce a tabletop textured in exactly the same way I textured my figure bases. 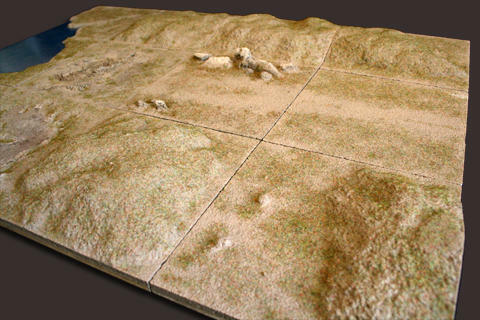 Making bases and baseboard the same would, hopefully, mean that figure bases could merge into the landscape.